Many of the mutations identified in CF occur in the first nuclear binding domain (NBF1), while very few occur in NBF2. This is a common feature of the ABC superfamily and indicates a separate role for the two binding domains. The most common mutation in CF DF508 occurs in NBF1. This results in a 3 bp deletion and the loss of a phenylalanine residue. The deletion causes a protein trafficking defect. If this defect is overcome then the protein can form a functional channel. This can be brought about by overexpression of CFTR or by culturing cells at > 30 oC. The NBFs contain a number of highly conserved motifs predicted to bind and hydrolyse ATP. 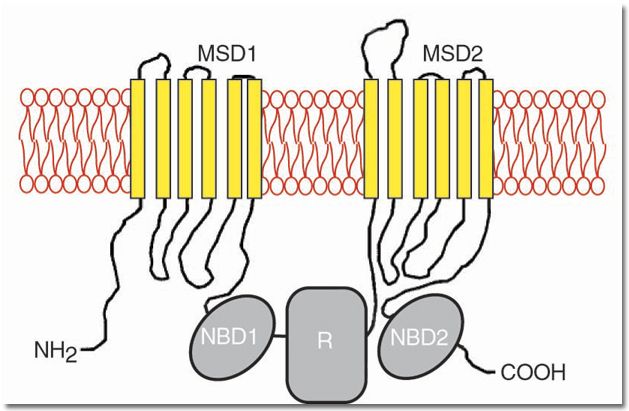 Site directed mutagenesis at these motifs have indicated that ATP binds to both NBFs to control the gating of the channel. c.1679G>C p.Arg560Thr R560T exon 12 G to C at 1811 Arg to Thr at 560; mRNA splicing defect? c.1800delG p.Ile601PhefsX10 1932delG exon 14 Deletion of G at nucleotide 1932 Frameshift a premature stop codon appears 10 codons further.